Film historian Mark Cousins turns a loving gaze to the extraordinary global talent of the legendary American filmmaker Orson Welles, using his voluminous paintings and sketches as a point of departure. 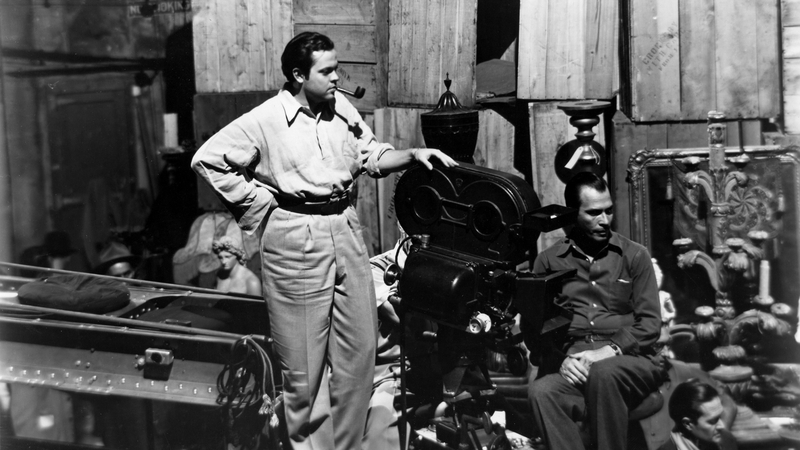 Having started his film directing career with one of the masterpieces of American cinema Citizen Kane, Welles himself has been as frequently regarded as a subject as his films have been watched. He’s been played by Danny Huston, Angus MacFayden, Christian McKay and Liev Schreiber; appeared briefly in Ed Wood; and has been the subject of a three-volume (with a fourth volume pending) biography by Simon Callow. His table talk has been jotted down by Peter Bogdanovich and Henry Jaglom. Documentaries have concentrated on different aspects of his career and personality: most recently his love of magic in Chuck Workman’s Magician: The Astonishing Life and Work of Orson Welles. It is as if Orson Welles – more than a filmmaker or an artist – is really a niggling problem that Hollywood needs to solve. He’s the ghost that haunts the Hollywood hills, wailing about studio betrayal, wasted talent and the contempt in which genius is held. So, Cousins’ new documentary The Eyes of Orson Welles presents itself very much as a personal act of rediscovery. And rather than looking at Orson – though it does that too – looks at the way Orson looks; at his gaze, his probing, curious peering and peaking and staring. From his youth, Welles was always a visual artist, sketching, drawing and painting whenever he had the opportunity. Cousins puts painting along with bullfighting and magic as his main loves, outside of but also seeping into and informing his filmmaking. From the drawings to the films and back again, Cousins demonstrates the typical gaze, the dynamic camera – as typified by the great opening shot from A Touch of Evil. But it is also a camera that is involved in the action, twisting and turning to see things, participating in the swirl of ribaldry in Chimes at Midnight or a closeup of Rita Hayworth in The Lady from Shanghai is no more, no less than a cinematic kiss. Welles’ camera is always looking up – think of those ceilings in Citizen Kane. And then there are always faces looking back, right into the camera, crowding the frame, as in his brilliant adaptation of Kafka’s The Trial. Cousins tells his story through a series of missives, fan letters ‘Dear Orson’-ing a series of observations and rhetorical questions that range from the witty to the whimsical as Cousins travels from Welles’ childhood home in Kenosha through the scenes of his early success first in Dublin then in Broadway and Hollywood to his later wandering in Europe. It’s cheeky to the point of daft having Orson replying and happily confirming Mark to be mostly right, but Cousins has a winning enthusiasm and his project is self-consciously indulgent. The nerve also feels fitting to its subject, though some will simply be glad to get a break from the Northern Irishman’s voiceover, whose vowels travel as far as he does. With a newly restored film showing at the Venice Film Festival this year – The Other Side of the Wind, produced by Netflix – there’s still life in the old Welles yet. Perhaps, given that his first taste of fame was found on the radio and his sound design is another aspect of his work that could be explored in full, a sequel, tentatively titled The Ears of Orson Welles wouldn’t be a bad idea. But for the time being any cinephile fan of Welles, or even someone who wants to know what all the fuss is about, The Eyes of Orson Welles is an enlightening essay on how this most famous of directors saw things.